LAUSANNE, Switzerland -- Four years ago, the bid team for Rio de Janeiro's campaign for the 2016 Summer Games came here and unveiled The Map. It was so simple, so breathtakingly elegant, so powerful. In a single stroke of unassailable logic, it showed it all: the Olympic Games had never been to South America. Three months later, when the International Olympic Committee convened in Copenhagen to vote for the site of the 2016 Games, Rio rolled to a runaway win. On Wednesday, the three candidates for the 2020 Summer Games -- Istanbul, Tokyo, Madrid -- took their chances for the first time before the full IOC, each hoping to generate the same sort of lightning that jolted Rio. There was no vote Wednesday. That will come Sept. 7, at another all-members assembly in Buenos Aires. Instead, the idea Wednesday was, again, elemental -- to spark momentum and roll to Argentina. All three candidates were judged to have performed well by the IOC members. But -- the clear surge Wednesday went to Madrid. As Alejandro Blanco, the head of the Madrid 2020 bid had put it in a briefing Tuesday with a small group of reporters, "I hope people look into our eyes and see the true passion we have," and by all accounts that's exactly what happened -- the Madrid bid jolted by the appearance on stage of Crown Prince Felipe, who drew wide praise for his energy, enthusiasm and, moreover, elegance in simply telling the IOC, "Madrid 2020 makes sense." Madrid had been thought by some -- who never did understand the dynamic -- to be lagging in this three-way race. After Wednesday -- no way. Then again, this is July. September is still two months away. And as Juan Antonio Samaranch Jr., Spain's executive board member, cautioned, what happened Wednesday amounts in the vote column to, as he put it, "nada." On hand Wednesday were 86 of the 100 members; a handful more are due in Thursday, when the six presidential contenders will make presentations and the IOC will also pick the site of the 2018 Youth Games from among Buenos Aires, Glasgow and Medellin, Colombia. Some 530 accredited reporters and camera crews were also on the scene at the Beaulieu congress hall, up from 160 at the similar event four years ago. Seventy percent of the 530: Japanese. There could be no single grand gesture Wednesday like The Map. There's no geographical singularity at issue in the 2020 race like there was in 2016. Beyond that, the world has changed considerably in four years. Indeed, the dynamics of this race have changed profoundly over the last several weeks, tied to the fluidity of the situation in Turkey. Once the three finalists were announced, the 2020 race has always been -- even before the unrest in Turkey -- in the first instance a referendum on Istanbul. Do the members want to continue the trend of going to "new horizons" -- say, Korea (Winter 2018) Brazil (Summer 2016), Russia (Winter 2014) China (Summer 2008)? Implicit in such a move are big construction projects. Istanbul comes with a roughly $19 billion infrastructure bill. Or does the IOC want to go to a more traditional venue, with lower capital costs? Tokyo, site of the 1964 Games, comes with a $4.9 infrastructure bill. Madrid, bidding for a third straight time -- and of course Barcelona played host to the 1992 Summer Olympics -- is stretching the envelope with a radically low $1.9 billion infrastructure tab. It's that low because, over the course of the prior two bids, pretty much everything there already got built. For Istanbul, the direction Wednesday was clear. Despite everything, there of course remains sentiment for the Turkish bid. For those members who might be leaning the Istanbul way -- the trick was to offer sufficient assurance, if not reassurance, that everything not only is would but would be OK, in time reassurance theoretically translating into votes. This must be understood: in the complex domino-world of IOC bidding, a vote for Istanbul takes Doha and Qatar out of the running for the Olympics, perhaps for a generation, and it's abundantly plain there are those within the IOC who simply do not understand -- or who are outright threatened by -- the potential of the Qatari wealth. All the presentations Wednesday were offered in closed session so word of what happened is, at best, reliable hearsay -- the IOC opting, despite vows of best-practices and good-governance transparency, not to make the show available on a closed-circuit feed to the nearby media room. During the Istanbul presentation itself, the protests and violence were only slightly mentioned. In the Q&A that immediately followed, the members offered no questions on the topic. As the members mingled at the IOC coffee break immediately after, the buzz was whether Istanbul had just effected a most sophisticated move -- or not. At the news conference that ensued thereafter, Ali Babacan, a deputy prime minister for economic and financial affairs, asserted that "non-violent peaceful protest is a very basic human right" and the government "has no problem with that" but does take issue with what he called "some illegal organizations … in the crowd." He also said, "Our police maybe made some mistakes." On the matter of social media -- Turkish prime minister Recip Tayyip Erdogan has called Twitter a "menace" -- Babacan said, "We have to drive good policies, inclusive policies" but cautioned that government is concerned such new media is "not used for illegal purposes, it is not used for bad purposes." How this jibes with free speech rights in a liberal democracy, of course, remains uncertain. In a later interview, Babacan said, referring again to the protests, "It is very natural in any democracy, these things happen. Every incident is a good excuse to learn from, to upgrade our practices, whether it's about freedoms or fundamental rights or so forth. It's a changing country, we shouldn't forget that. It's a changing country, an evolving country, moving for better and better." He also said that Erdogan -- who, according to most accounts, is the government voice that matters in Turkey -- would be in Buenos Aires: "He is going to be our chief." And he noted that Erdogan, before turning to politics, used to play soccer. The deputy noted of the prime minister, "He is very into sports." The Japanese came next, unveiling a government-sponsored initiative dubbed "Sport for Tomorrow" comprised of overseas projects aimed at promoting the Olympic movement, the creation of a Japan-based international sports academy and support for the World Anti-Doping Agency. What the Japanese have -- no problem -- is money. They have a $4.5 billion reserve fund, cash, sitting in the bank. What they also can tout is security. "The other day my daughter lost her wallet," the Tokyo governor, Naoki Inose, said Tuesday. "It contained $600. The wallet came back. And it contained the cash in the wallet." What's at issue is whether they can convey to the IOC the passion they assuredly feel, and in particular the way the 2011 earthquake and tsunami in northeastern Japan have served as a catalyst for the bid, and indeed the entire country. Takeda, proclaiming that Japan's "affected areas are now rising," said that by "maintaining your hopes and dreams, you can rise again," adding, "We can show the world … that is the power of sport … by giving them hopes and dreams through the power of sport, it is possible to rise up." The Madrid team closed the day. The Spanish capital would have to build only four new permanent venues and three temporary sites. In the world of Olympic bids, this is a novel approach, indeed. Because of the bids for 2012 and 2016, "The promises made then are today realities," Samaranch Jr. explained. 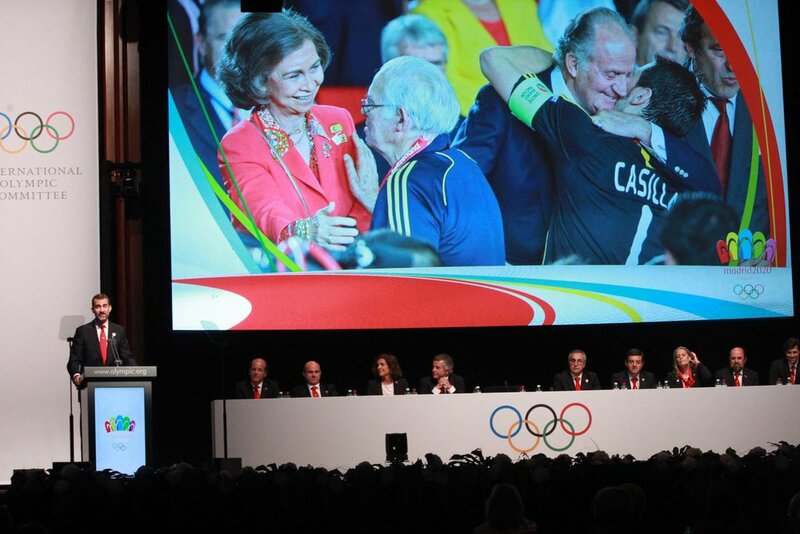 The Madrid bid was presented with but five questions from the IOC members. None dealt with the Spanish economy -- a notion perhaps unthinkable perhaps even six months ago. "A realistic bid for realistic times," Blanco said at the news conference following their presentation. He also offered an extraordinarily fresh take that perhaps ought to be the new 21st-century template for what the Games should be: "Many years ago [the talk was of] the globalization of the Olympic movement," adding, "The true globalization comes today from television. The Games have to be a reality of the country, a reality of the world in which we live. Madrid presented a bid that is compact and a reality of the times in which we live." On top of all that came the appearance on stage of the crown prince, the honorary Madrid 2020 president, an Olympian and Spain's flag-bearer at the 1992 Barcelona Games. One IOC member called the prince, who told the members he wanted Spain to again feel "promise and hope," the "star performer of the day." "Whatever the goalposts were, he moved them," the member said. Added Craig Reedie, the chairman of the IOC 2020 evaluation commission, emphasizing that he was observing, not endorsing, Madrid "lifted their game." Two months now until the vote in Buenos Aires. Only one thing matters. As Masato Mizuno, the Tokyo 2020 vice president and chief executive put it in a comment that could apply to all three bids, "We have to get more votes. We have to work hard from now until Sept. 7." The 2020 evaluation report the International Olympic Committee published Tuesday ran to 101 pages, without annexes, maps and so on. This so-called technical report was finalized in April, before the unrest erupted in Istanbul, and so the IOC is in the sensitive position of having put out a document that may have already been overtaken by events. Even so, it is clear that this report describes Istanbul as a large and complex city with a widespread plan that would be more difficult to deliver than Madrid's or Tokyo's; that Madrid is in good shape in terms of compactness and things already being built; and that Tokyo, in terms of risk, is predictably the least problematic. The riots and protests almost surely have enhanced the chances of the other two candidates. As Istanbul's mayor, Kadir Topbas, said Monday, images of the violence have tarnished Turkey's image, and if it keeps going on, "Istanbul stands to lose." The IOC will meet next week in Lausanne, Switzerland, to hear presentations from all three 2020 bid cities. It will pick the 2020 winner by secret ballot Sept. 7 at a session in Buenos Aires. The challenge confronting the Istanbul bid is straightforward. As the evaluation report notes on page 9, "Istanbul 2020 aspires to reposition Turkey and to foster global understanding and inclusiveness by being the first secular Muslim country to host the Games." At the root of the unrest in Turkey, however, is the perception among many of the protestors of a shift away from the secular and toward the religious -- that is, toward a more Islamic society. That has to give pause to any thinking member of the IOC. Asked on a conference call Tuesday with reporters about the violence, Istanbul 2020 bid leader Hasan Arat said, "We will be very open. Now the protests are largely calmed down. We will tell them how it starts and how it ends. We will answer any questions they have," adding a moment later, "IOC members are very experienced, and they understand the Games are seven years away." At the same time, there are indeed bound to be questions. Like -- the evaluation report says in describing the Istanbul project, on page 10, "As a major user of social media, an emphasis would be placed on the use of social media, particularly with regard to engaging young people." How, exactly, would that work in a country where the current prime minister has called Twitter a "menace," and says, "The best example of lies can be found there. To me, social media is the worst menace to society." The transport plan for Istanbul's 38 venues, divided into four zones and seven venues "across the city"? The bid says travel times would amount to a maximum 35 minutes. The commission? That "may be optimistic for the most distant venues." Istanbul's population now totals 13 million. It's due to grow to 16 million by 2020 with car ownership growing by 10 percent annually. Even with an expanding metro system, the commission thus "believes that the risk of road congestion during the Games remains high." Compare that to the language for Tokyo's transport section: "robust." Note the difference in the IOC code words for the "ambitious" Istanbul opening ceremony: "close attention," "detailed planning," "operational complexities." Or the dry, non-judgmental way the report assesses the Spanish economy. It notes that in 2012 it was in recession. Then it simply cites growth rates between 2013 and 2016. Then: "the Commission believes that [the] Spanish economy should be able to support the delivery of the Games." This, of course, has been for many the primary concern about the Madrid campaign -- and that's all the report has to say about it, no more. That, though, is not the most interesting take-away in this report. Normally, evaluation commission reports tend to be so technical and analytical that many IOC members, candidly, don't even read them. This 2020 evaluation report, however, is -- even factoring in the unrest in Turkey -- worth a close read. There are, like the Istanbul traffic and the Spanish economy, signals in this document that are there to be read. Whether they ultimately prove decisive is yet to be determined, of course -- but they are for sure there in black and white. On page 68 comes a distillation of Tokyo''s finances, what's drily called a "Hosting Reserve Fund." That's the $4.5 billion in cash that's been sitting in the bank since Tokyo bid, and lost, for the 2016 Games. Again, and for emphasis -- that's $4.5 billion, in cold cash. That sum is held by the Tokyo Metropolitan Government. The national government has pledged to spend the money -- estimates vary from $1.5 to $1.9 billion -- needed to re-do the Olympic Stadium in time for the 2019 Rugby World Cup and, if Tokyo wins, the 2020 Summer Games. So that's money that wouldn't come out of the $4.5 billion. As the commission notes on page 68, that $4.5 billion "exceeds the proposed amount of government funded capital expenditures associated with the Games and its presence significantly reduces the risks normally inherent in the delivery of Games infrastructure by government." In the very next sentence: "Furthermore, during the Commission's visit, it was clarified that the fund, which was established at the time of Tokyo's bid for the 2016 Games and has remained in place since that time, could also be used for Olympic-related purposes not linked to construction, provided that the appropriate authorizations were obtained." Olympic-related purposes not linked to construction? The mind can imagine dozens if not hundreds of uses for such a fund -- all of it legal, all of it appropriately authorized. Particularly since the report also helpfully notes that no capital investment would be requires for transport, airports, accommodation, electrical infrastructure or security. Little wonder the Tokyo 2020 bid team adeptly put out a press release noting, among other matters, the "several references" to the "Hosting Reserve Fund" and saying it was, overall, "extremely pleased." ST. PETERSBURG, Russia -- Tokyo 2020's Yuki Ota, a two-time silver medalist in fencing, bounded across the stage and said to the crowd, with enormous energy and enthusiasm, "It is great to be back in St. Petersburg," where he had competed in 2007. Everyone laughed, and he had them from there as he said, "I can promise that Tokyo 2020 will see your sports shine." A few moments later, Jaime García-Legaz, at the lectern for Madrid 2020, tackled the pink elephant in the room head-on -- the Spanish economy. His nation's minister of commerce and international trade, García-Legaz noted that the International Monetary Fund and others project "steady" economic growth for Spain in the next five years, adding, "The fundamentals of the Spanish economy are strong and deep." Meanwhile, the Turkish minister for youth and sport, Suat Kiliç, his tie knotted just so and his pocket square sitting just right, said in an interview after confidently rocking his presentation, "We believe Istanbul will deliver a unique chance. Not just for the Olympic movement but for global peace." With precisely 100 days to go before the International Olympic Committee selects the 2020 site, the three cities in the race took their presentations public Thursday for the first time, throwing the race into a fresh phase -- not only revealing strategies but minting personalities likely to frame this campaign homestretch. The IOC will vote by secret ballot Sept. 7 in Buenos Aires. Intriguingly, each of the three cities sought to play the safe card -- that is, asserting that it could best offer the IOC financial security in these uncertain economic times. Given that the three offer wildly divergent construction budgets, each came at the notion Thursday on stage from wholly different approaches. Each also struck a markedly different tone. Istanbul, bidding for the fifth time, its first time as an "emerged nation," according to campaign leader Hasan Arat, sought Thursday to highlight the allure of a Games that would go for the first time to a nation with a Muslim majority and that literally and figuratively bridges Europe and Asia. "You have one city where you see the sun rise on two continents," Arat said. "We have a city that bridges light and shade, old and new, east and west," Kiliç said. "Istanbul shines like a diamond." At that, up came a short film accompanied by the Rihanna hit "Diamonds." Mostly, though, the emphasis was this: Istanbul's $19.2 billion infrastructure plan would, according to Kiliç and Arat, be worry-free. Over the past 10 years, Turkey's economic growth has averaged more than 5 percent annually, Kiliç said. It is now the 16th-largest economy in the world, projected to be in the top-10 -- as ranked by gross domestic product -- by 2023, the 100th anniversary of the founding of the Turkish republic. As a sign of how things are booming in Istanbul, Kiliç pointed out, just Wednesday Prime Minister Recep Tayyip Erdoğan broke ground on a third bridge over the Bosphorus strait -- a structure that will be the longest combined road and railway bridge in the world, with a combined capacity of 270,000 cars, scheduled for completion by the end of 2016, at a cost, privately funded, of $4.5 billion. The bridge was not included, incidentally, as part of the $19.2 billion in the bid file -- the tender process had still been ongoing. Arat asserted, "This week our focus has been risk-free delivery, proving that we are ready to be perfect partners." Madrid's infrastructure budget would be one-tenth Istanbul's: $1.9 billion. Eighty percent of its venues are already in place -- this being Madrid's third bid in a row. Simply put," the bid's chief executive, Victor Sanchez, said, "Madrid 2020 makes sense." He added, "We will have zero white elephants, only four new permanent venues and three temporary venues. All are already budgeted for and fully guaranteed." Added Alejandro Blanco, the bid's president, "Madrid 2020 is not a bid of dreams -- we've already built them." García-Legaz, on stage in a clear bid to evoke memories of Brazil's central banker, Henrique Meirelles, key to Rio de Janeiro's winning 2009 campaign for the 2016 Summer Games, said real data shows that Spain leads export growth in the Euro area, with an expected increase of 4.2 percent, compared to 3.3 percent for Germany. Moreover, Spain will have the second-highest balance of payments surplus in the coming years among the five biggest European economies, behind only Germany. Meanwhile, in a clever turn, Marisol Casado, the president of the International Triathlon Union, began the Madrid 2020 presentation with this introduction, "I am one of the three IOC members from Spain," a fact that remarkably gets little play but may ultimately prove significant. Madrid can work the room with Carisol; José Perurena López, president of the International Canoe Federation; and Juan Antonio Samaranch Jr., the IOC executive board member. Turkey has one IOC member, Dr. Ugur Erdener, president of the international archery federation. Similarly, Japan has just one active member, Tsunekazu Takeda. In a vivid contrast from the often-dull affect of the Tokyo 2016 bid, it wasn't just Ota who on Thursday was pumped up. Takeda's passion for the project was vividly on display. So, too, Tokyo governor Naoki Inose, bid chief executive Masato Mizuno and the others. The connection that the Japanese team forged with the audience was notable -- and from the get-go, with Takeda, at the lectern, extending "best wishes" to the "European cities of Istanbul and Madrid," then noting, "We are proud to carry the hopes of Asia," home to "more than one billion young people." When the Japanese team came home last summer from London, half a million people took to the streets in welcome. "Imagine that passion in 2020," Ota said, and as the closed-circuit camera panned to the audience around the LenExpo Center, heads nodded all around. Tokyo's construction budget: $4.9 billion. The message from the Japanese: "certain delivery," because as they have noted time and again, they have $4.5 billion of it already squirreled away in the bank, just sitting there. If it were a country, Inose said, Tokyo's economy alone would almost make the global top-10. Moreover, he said, Tokyo is itself safe -- a different kind of clever tack in a world where security issues are always at issue. "If you lose something," Inose said, "many times it returns to your hands, including [the] cash." In concluding, Takeda made his pitch: "In these uncertain times, Tokyo offers certainty. You can have total confidence that we will deliver." Then, continuing slyly: "In a city that bridges and unites two global cultures, east and west -- and which will connect with all five continents. "Tokyo 2020 will be Games that reach new generations in these challenging and fast-changing times for sport."